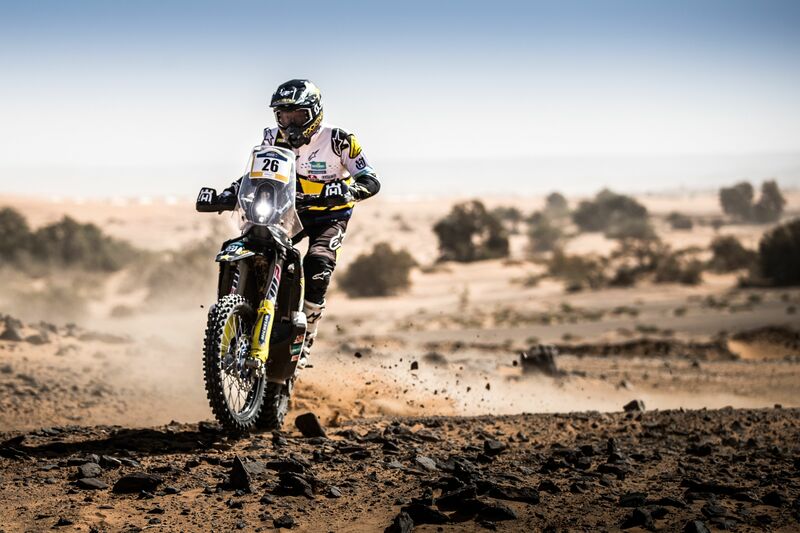 Reaching the end of a challenging two-day-long Marathon Stage without any problems, Rockstar Energy Husqvarna Factory Racing’s Pablo Quintanilla and Andrew Short have posted the seventh and 11th fastest times respectively on the fourth stage of the 2018 Merzouga Rally. After more than 1,000km in the dunes and dusty trails of Morocco, Quintanilla and Short were faced with a challenging stage four at the Merzouga Rally. Enjoying a solid start to the day’s timed special they were among a large group of racers who lost the correct route less than 10km before the finish of the special. Making use of his vast rally racing experience, Quintanilla managed to salvage a seventh-place result for the day. With just one shorter stage remaining at this year’s Merzouga Rally, the reigning Cross-Country Rallies World Champion is now fifth in the provisional overall standings. Showing some great speed in the opening part of today’s timed special, Andrew Short brought his FR 450 Rally machine home in 11th position. Continuing to learn and collect racing experience, the American is looking forward to tomorrow’s fifth and final stage of the Merzouga Rally. Featuring a mass, motocross-styled start, the fifth and final stage of this year’s Merzouga Rally features a 48km timed special contested 100% in the massive dunes of the Moroccan desert. It will be the last step on the way to the finish of this demanding week-long event in Africa.